Image example Na on 8 September 2017 na im people gather for di first night football match since thirty years for Konis Stadium, Modadishu. Somalia don begin build headquarters for dia football association; something wey dey happen as di country wan begin move towards normal life, after plenty years of terrorist attacks dem. 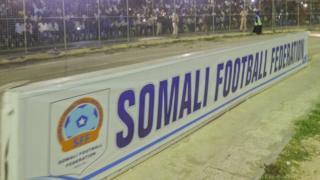 Na for September dis same year na im Somalia hold di first night-time football match for Mogadishu since nearly 30 years. Na with heavy security dem play di match for di Konis Stadium, wey FIFA help di country repair. Dis fit be why di Council of East and Central Africa Football Associations [CECAFA] write letter say dem sef y jollificate as Somalia don lay di foundation stone for dis building. Di CECAFA General Secretary, Mr. Nicholas Musonye, say in dey "happy to hear di good tori," and im wish Somali Football Federation President Abdiqani Said Arab "good luck for all di good work wey im dey do for Somalia and African Football." Somalia dem Football Federation Media Department confirm say di new headquarters na FIFA still dey put money for am, under di FIFA Forward project. Di centre go dey ready by 2018 and dis go be di first time for history wey Somali Football Federation officials go dey work inside building wey dem no rent, but one wey di federation demself own.